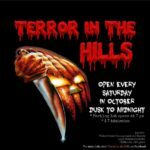 This weekend (October 13th – 15th) is one of the biggest Halloween weekends in Ross County. Many events are using Friday the 13th as the kickoff for their activities – what a perfect date for kick-off of Halloween events! With this blog post, we’re just focusing on Halloween events but if Halloween isn’t your ideal theme- check out our online calendar of events for many other events. Kicking off the weekend is the first Chillicothe Halloween Festival in Yoctangee Park. This festival is a three-day event that will feature Halloween-themed merchandise and entertainment, along with plenty of festival foods, carnival rides, mechanical rides, inflatables and live entertainment. There will be contests for pumpkin carving, costume contest and a soapbox derby-style Coffin Races. The festival gets underway on Friday the 13th at 11am, with an opening ceremony taking place at 5:30pm on the main stage with a special guest. The festival will run until 10pm on both Friday and Saturday and 10am – 6pm on Sunday, October 15th. 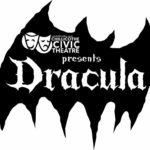 Chillicothe Civic Theatre takes the stage at the historic, Majestic Theatre this weekend with their fall production, “Dracula”. The play’s opening night will be on Friday the 13th. The production will take place Friday and Saturday at 7pm with a closing matinee on Sunday at 3pm. This is the classic tale of Count Dracula. Hopewell Culture National Historical Park offers their annual the Great Pumpkin Walk on Saturday, October 14th. Visit the park during the morning to help carve pumpkins that will be displayed that evening around the trails of Mound City Group. 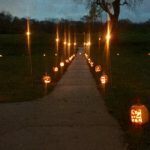 Carved pumpkins will be illuminated in the evening for visitors to walk around the trails near the magnificent earthworks. Following the the walk, carvers can take their masterpieces home with them. The Pump House Center for the Arts will hold their opening reception for local artist, A.J. Good on Friday the 13th. During this reception you can meet A.J. Good, enjoy refreshments and view his collection of masks and tattoo art that is on display. If you haven’t seen his artwork, you will definitely want to make time to stop by the Pump House before this exhibit ends. Although the following events aren’t as limited-time only as the ones previously mentioned, this will be the perfect weekend to add these on to your Ross County Halloween Experience. Haunted Mountain, on Sugarloaf Mountain (home of Tecumseh! Outdoor Drama during the summer months). This year’s event has been taken over by Zombies. This year’s trail takes the scare to new levels with the interactive zombie hunt. Players get to compete with each other to see who can get the most “kills” before the end of the tour. 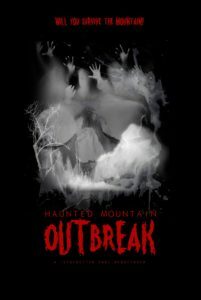 While you’re on the mountain, try out one of the escape rooms – this is included in the zombie hunt ticket. This takes place on Fridays and Saturdays in October. If that isn’t enough scares for you, Ross County has three more stops you can make. Next up is the longtime-running Terror in the Hills. This event is presented by Harrison Township Volunteer Fire Department each year and offers grand scares and a Zombie Paintball Shoot. This terrifying trail will take you through the woods to get the adrenaline pumping through your veins. This event takes place on Saturdays in October. Haunted Hills at Magic Waters is a more family-friendly haunted trail. There’s still scares during along this trail, but they try to keep out the blood and gore. This year’s version is all new and will be celebrating opening night this Friday (the 13th). In addition to opening night, the trail will be open on October 14, 20, 21, 27, 28, 29, 30 & 31st. This year marks the 27th annual Haunted Hills at Magic Waters. Wrapping up the Halloween events will be Backwoodz Oddities‘ haunted house. The Last Carnival is a haunted house that will scare the pants off of anyone willing to enter. This haunted house features actors and animatronics. The haunted is open every Friday and Saturday in October. If you want to experience all of the Halloween fun in Ross County, there’s still time to book a room at one of Ross County’s lodging facilities. Visit our Where To Stay page for listings of hotels, cabins and bed & breakfast locations. Many of these locations are only minutes away from all the haunted attractions and events.